To link a child in the Children module with a parent in the Address Book you first need to have the parent in the Address Book module. 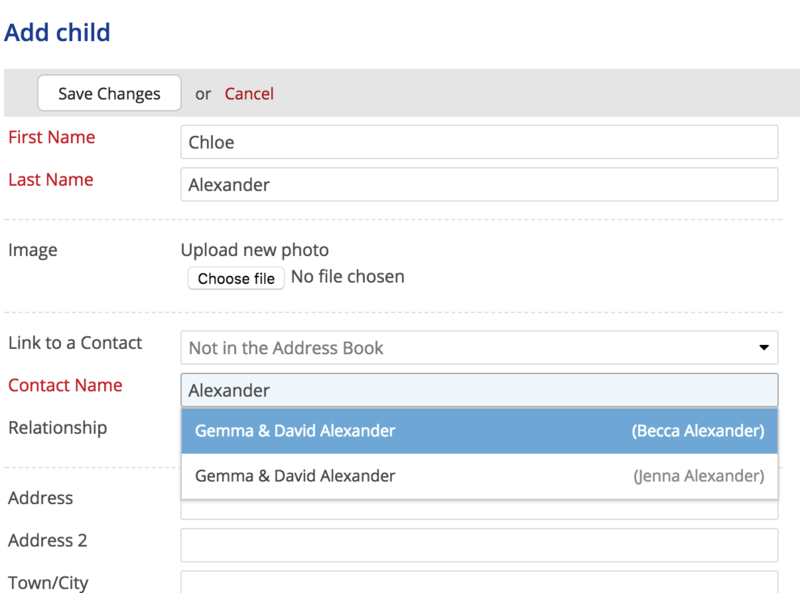 Children can exist in the Children module without a linked parent in the Address Book i.e. as an unlinked parent, with the parent contact details recorded against the child contact. Head to the Children module and click on the "Children" menu to view a list of the children in your database. Locate and click on the name of the child. On the child's profile page, select "Edit child", and scroll down to the "Link to a Contact" section (see screenshot below). Choose between "Not in Address Book" (in which case you would manually enter the child's parent contact details), or, if the parent is in your Address Book, choose "In the Address Book". Begin to type the linked parent name - the system will auto-suggest as you type. Select the primary parent to be linked - the child will be auto-linked to their other parent by virtue of the linked spouse/partner relationship status of the primary parent. 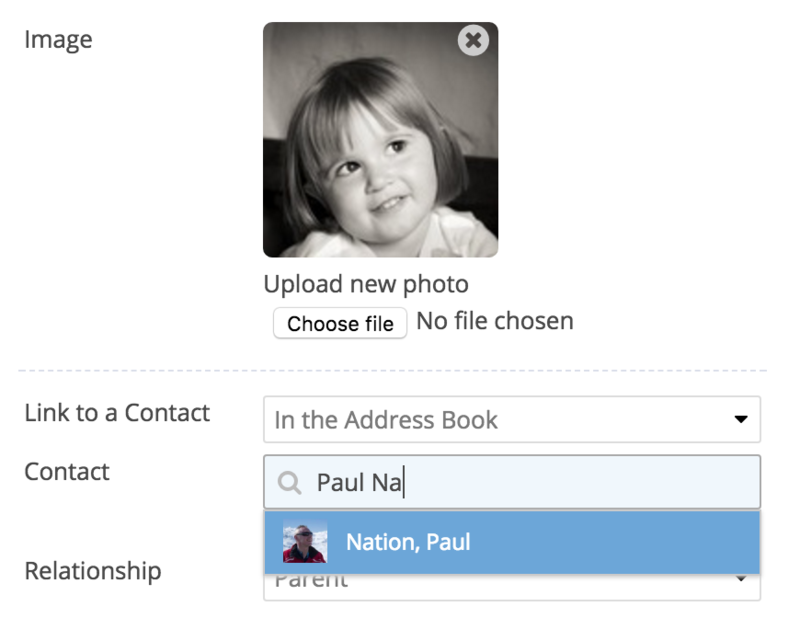 The linked parent contact details are then automatically populated against the child. Save your changes before navigating away from the page. On the child's profile page you will now see the linked primary parent in the "parent" section. The "At this address" box on the right hand side of the screen is also quite useful, as it shows the child's entire household and any linked relationships. As you link each child in a family to a parent, sibling relationships and relationships to other household members are also created (as shown in "At this address"). Does it matter which parent you link the child to? For instance, you may find yourself linking one sibling to the mother and another sibling to the father. Not to worry - ChurchSuite puts all the pieces together as long as "Mother" and "Father" are linked in the Address Book (e.g. marital status married, separated or cohabiting). Why can I only link a child to one parent? This is just a matter of keeping things simple. In the vast majority of situations you only need to link a child to one parent because, as long as both parents are linked in the Address Book (as explained above), the system will automatically link the child to the other parent too. For example, if a child's mother and father are linked in the Address Book (i.e. linked partner/spouse), linking the child to one parent will automatically have them linked to the other. If the child's parents are not linked, perhaps if they are divorced, then if both parents are still in the church and therefore in your Address Book, you will need to amicably agree with them pastorally which parent is to be used for the linking. However, in this scenario, note that there are optional fields (enabled in the module's settings) for adding additional [parent] mobile and email addresses. This information will ensure that the other parent is still included in your email or SMS communications when emailing parents. Also in this context, we recommend linking a child to the parent with whom they normally reside, since the child inherits the contact address details of the linked parent. A 'pinned' note can be added against the other parent to indicate a parent/child relationship, if desired. The additional parent contact details carry the same communications priority as the primary/linked parent, so any communication sent as "Send to Parent" will go to the primary linked/unlinked parent and also to the additional parent contact, ensuring divorced parents are both kept informed. The "Send to all Parents" option will send in the same way, but will also include the linked partner/spouse of the primary/linked parent. The "Additional Mobile" and "Additional email" fields are optional fields that must be enabled in the Children module settings before they can be used. Click the cog wheels in the top right corner of the Children module and locate the "Child Fields" section. Note the two check box options to enable the additional email and mobile fields. What if the child's parents are not in the Address Book? 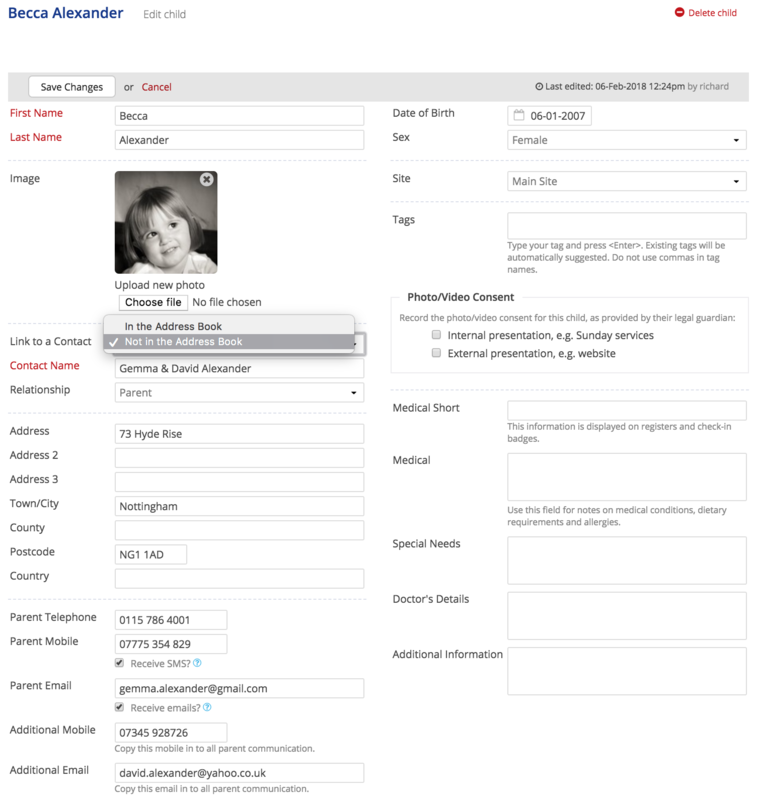 ...or you can use the Additional Mobile and Additional Email fields for the second parent's contact details. When adding multiple children from the same family whose parents are not in the Address Book, ChurchSuite will auto-suggest potential unlinked parents contacts from existing children records. In this way, the same parent contact details (email, telephone, address etc) are assigned against all unlinked children that belong to the same family. You can also easily add unlinked (non Address Book) parents to the Address Book using the "Add parent" option - this option assumes you have appropriate data protection consent to add the parent(s) to the Address Book. What happens if you delete a linked parent from the Address Book? 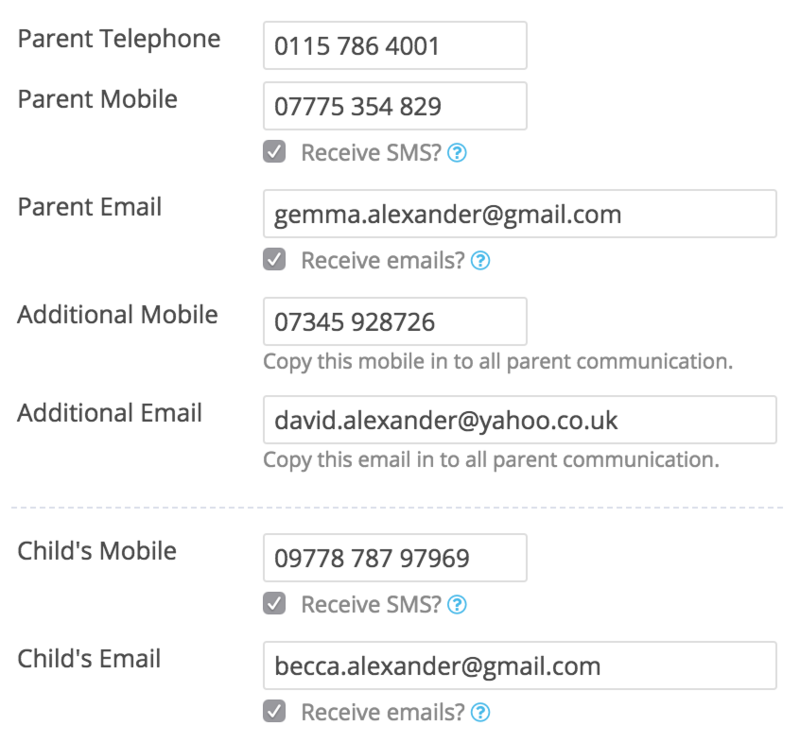 When you delete an Address Book contact who's a linked parent of one or more children in the Children module, ChurchSuite will unlink the parent from each child and retain the parent contacts details (name, address, email, mobile, telephone) against each unlinked child's profile. Importantly you won't lose any of that all-important parent contact information on your children records, even if the parents are deleted in your Address Book.